On December 31, one of the biggest events in Ultimate Fighting Championship (UFC) history will be shown on national television. Chuck "The Iceman" Liddell and Tito "Huntington Beach Bad Boy" Ortiz will face each other at the MGM Grand Garden Arena in Las Vegas for the light heavyweight championship. Two of the UFC's hottest superstars are about to settle their long-standing rivalry during this monumental match dubbed UFC 66: LIDDELL VS. ORTIZ II. It's been nearly two years since they last met on the Octagon ring, but their rivalry remains more heated than ever. Known for being the most popular, no-holds barred, mixed martial arts sport in the world, the UFC has made Ortiz and Liddell's careers the stuff of legend. Current UFC Light Heavyweight Champion, Liddell (19-3-0) has knocked out his last six opponents, including Ortiz (16-4-0). Meanwhile, as one of UFC's most controversial fighters, Ortiz's final step in completing his successful return comes down to this match: the ultimate fight against his former training partner to reclaim the light heavyweight title he once had. Don't miss the Lidell-Ortiz fight, considered one of the biggest matches in modern UFC history. 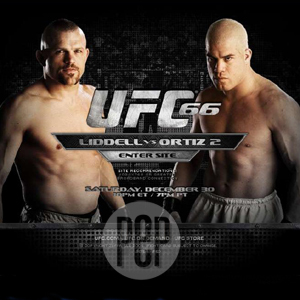 Catch UFC 66: LIDDELL VS. ORTIZ II, December 31, 11 AM, LIVE on RPN 9.